The December meeting of the Club will be held on Saturday, December 15, starting at 7 pm, in the basement of the North Terrace book-cafe 서울시 종로구 율곡로 10길 12, (12 Yulgokno 10 gil, Jongno-gu, Seoul), opposite the main gate of Changdeok-gung palace. This month, instead of talking about a story we've read, we propose to attend a book launch on Saturday, December 15, listen to the translator Anton Hur, meet the publishers, and buy copies of the book to discuss at our meeting next month. Anton Hur was the translator of "The Court Dancer" that we read last month . . .
Kang Kyeong-ae (1906-1944) was a Korean writer whose stories are remarkable for their rejection of colonialism, patriarchy, and ethnic nationalism during a period when such views were truly radical and dangerous. Born in what is now North Korea, Kang wrote all her fiction in Manchuria during the Japanese occupation and witnessed the violence and daily struggles experienced by ethnic Koreans living in the Japanese puppet state of Manchukuo. Kang's riveting stories are full of sensitivity, defiance, and a deep understanding of the oppressed people she wrote about. Anton Hur was born in Stockholm, Sweden. He is the winner of a PEN Translates award, a Daesan Foundation grant, and multiple LTI Korea and Publication Promotion Agency of Korea grants. His translations include Kyung-Sook Shin's The Court Dancer (Pegasus Books), as well as stories in Words Without Borders, Asymptote, Slice, Anomaly Literary Journal, and others. 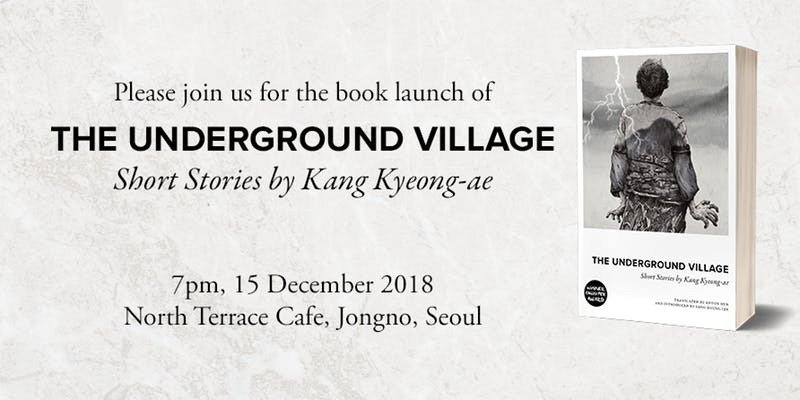 Please join us at the beautiful North Terrace Cafe in Jongno (next to the even more beautiful Changdeokgung Palace) to celebrate Kang's important work and the first English collection of her stories. The North Terrace Book Cafe is located at Yulgok-ro 10-gil, Jongno 1234, Jongno-gu, Seoul. Go to Anguk Station on the Orange #3 Line. Go out Exit 4 and do and immediate U-turn on the sidewalk. 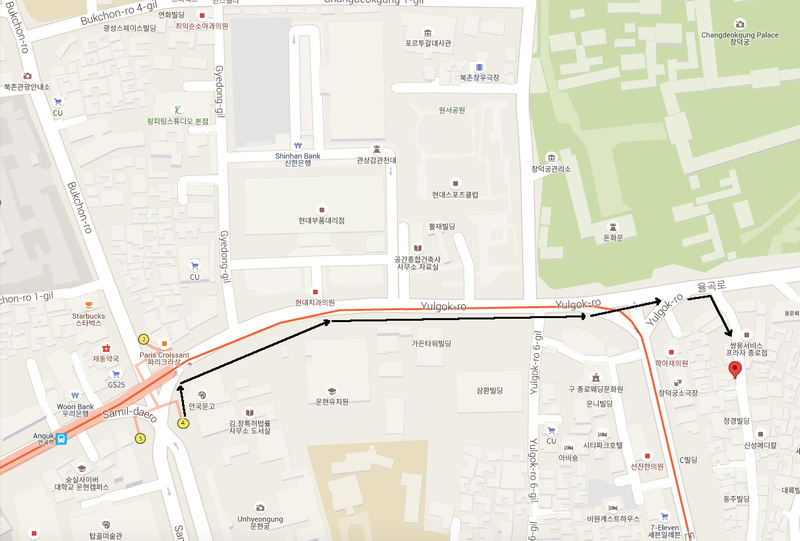 Then take a right in front of the Japanese Cultural Center and walk towards Changdeok-gung, but on the opposite side of the main street (Yulgok-ro) from the palace. American bnessman and gold miner Albert Taylor came to Korea in the early 1900s. In 1917 he met British stage actress Mary Linley and they married. They lived until January 1942 in Seoul, mostly in a house called Dilkusha, located near the Sajik Tunnel. Mary Linley Taylor wrote two books about her time in Korea. Recently, the Seoul Museum of History received a donation of photographs and documents from the Taylor family, and now there is a special exhibition on display. Come and join us as we look around it and talk about life in Seoul as a foreigner under the Japanese colonial administration. Given everyone's tight mid-day schedule, please be on time, noon, as we will have to enter the museum as a group at that time. Should you arrive late, you may catch up with us at the special exhibition area. The Seoul Museum of History is located 5 blocks west of the Gwanghamun 4-way intersection. We plan to enter the museum at 12:00pm. The Royal Asiatic Society Korea Branch is pleased to announce a new addition to our existing programs and social outings: The RASKB Cuisine Club. The purpose of this club is to bring together members and friends to experience the best of Korean cuisine, from cooking to eating. With this new social organization alongside our existing Business Club, we will explore food from all corners of the peninsula, and beyond. The group will meet on a monthly basis at local restaurants, cooking schools, and other spots of culinary interest, combining good food and good company. To join us, please go to the Cuisine Club Face Book page with your name, contact information, and how many people will be in your party so that we can make accurate reservations. The final bill will be equally split between all attendees. These visits comprise of 2 parts: the first is a short walk through the exhibit, followed by the second which is usually a presentation and a Q&A session on a related topic of the exhibit. This year, visits will be held on the following dates. Next visit to be announced later. Is photography one of your greatest or most recent interests? Do you wonder how you may improve your images? Are you curious just how some people’s photos are often better than your own? Would you like to understand some of the cultural as well technical aspects of travel and portrait photography? Would you like to spend two hours each month with like-minded people? If you answer any of the above questions in the affirmative, we may have created something special for you. The Royal Asiatic Society Korea Branch is offering a series of photography workshops for the third time. Next Workshop to be scheduled in April 2018. Details to follow, later. RSVPS are required to allow proper preparation of handouts. To reserve your place, please click here. Experienced photographers are encouraged to bring their tripods. Inexperienced photographers are welcome to just show up with their smartphones! You may board one of the green buses at the bust stop located north by 100 meters from of Exit 3 of Gyeongbok-gung Line 3 subway station. They will get you to either to the indicated traffic light where you get off at “Gyeonggi Sang-go (경기상고)” bus stop, cross the boulevard, turn left and walk to small brick Chinese restaurant and take a right up the hill along Jahamun-ro 33 - or you will need to get off the bus immediately after it takes an early right turn to the entrance to “Gyongbok Gogyo (경복고교), where you have to double back one block, cross the boulevard and turn right, to the entrance of the street with the school yard corner and the small brick Chinese restaurant, where you turn up the hill, along Jahamun-ro 33.